After 28 years with the Richmond Police Department (RPD), Harrisonburg’s new police chief, Eric English, doesn’t think there’s a lot that can surprise him. English’s overall goal is at the same as it’s always been. Hand in hand with this vision comes engagement with the schools. For English, that means little things like being present at lunch (or recess in the elementary schools). Much of English’s approach to school involvement comes out of hard-learned lessons from his time in Richmond. During his time there, he was in charge of Richmond’s student resource officers (SROs). Many times, SROs would be called into disciplinary situations the administration should have handled. LIFE stands for law enforcement intervention focusing on education. 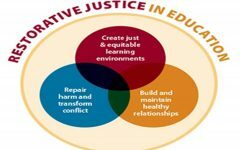 In Richmond, it’s a program that uses restorative justice principles, something that the HHS administration has already implemented. English does plan to keep more rigorous statistics on the number of students who get involved with the justice system, but right now, he doesn’t see an issue. His main goal for the time being is to broaden students’ experiences with the police department. Some of English’s ideas include a lunch buddy program and a police athletic league. What actually comes to fruition depends on the amount of resources English can mobilize.